Leaving a harbour is always easier than finding and entering it for the first time. A good almanac will provide all the information needed for doing both activities safely. Reeds Nautical Almanac, known as 'The Yachtsman's Bible', will have up-to-date details of regulations, signals, buoys, lights, tidal ranges and timings of high and low water. 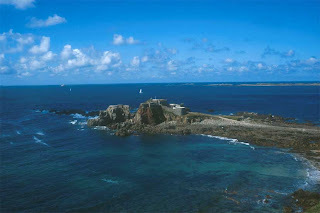 Most importantly, it will describe hazards to navigation such as the underwater extension of the breakwater at Braye. Maintenance of this submerged 500 metre hazard was abandoned in 1872. Thereafter the extension gradually collapsed, leaving a mound of stones and rubble. At low water this obstruction lurks 3 or 4 metres below the surface, so that when the ebb gathers momentum, you can guarantee there will be surface turbulence above what remains of the extension, making it a place to be avoided, especially in bad weather. When departing for Exmouth at ten in the morning, I made sure "Phillida" was well-clear of the hazard. As I steered a true course of 330 degrees, the wind pushed us along at about two knots, and although visibility was limited to no more than a mile, I was not apprehensive as I had been at the start of the cruise. A mile or so from the entrance, ‘Phillida' bobbed through a bundle of breaking waves associated with a race, which was setting to the northeast. Ten minutes after entering the turbulence we found ourselves in smooth water again. Visibility improved as the sun burnt through the haze. A large ship carrying a cargo of timber passed ahead about a mile away while heading up Channel. My boat looked pristine. Her sheets had been washed by the sea and bleached by the sun. Her decks were scrubbed, and all was shipshape. Her white sails captured the willing breeze and her captain rejoiced as she skipped over sparkling sapphire waters. Casquettes Rocks, marked by their prominent lighthouse were astern, and with the current setting us clear, those granite daggers could cause us no harm. Another freighter, much larger than her predecessor, cleared our bows as she lumbered north-eastwards, following the wakes of those that had gone before. It was soon mid-morning and things couldn't have been better. The wind oscillated between Force 2 and 3, enabling a boat speed of 3 to 4 knots. Yet another freighter headed up Channel. Preparing and eating a Marmite sandwich while steering by hand was a tricky business requiring forethought and dexterity. To succeed at making the sandwich without getting the tacky brown-stuff on the tiller and without dropping the knife in the bilge required tactile agility. 'Phillida' was sloshing along at her maximum speed. An undulating swell from the southwest caused me to wonder if the weather would hold, and by mid-day there was not a hint of wind. Without warning the sea became lumpy, and this strange phenomenon caused me to exit the area rapidly by calling upon my willing slave 'Sherpa'. He cheerfully and nobly obliged by habitually first coughing up clouds of blue smoke before exhaling colourless gas. For a short while we merrily continued under power until an obliging, perhaps jealous wind filled our sails. Apart from a never-ending convoy of ships, I had no complaints – at least they were company of a sort. Conditions were perfect. The early afternoon forecast confirmed that the easterly 3 to 4 wind would continue. I hove-to and bailed out water that had seeped into the bilge. When the boat was moving again I fortified myself with chunks of bread dunked in cold tomato soup, and for a sweet, I consumed a small bar of Cadbury's Dairy Milk Chocolate, along with a handful of McVities digestive biscuits. While I was feasting I failed to keep an alert lookout, and my lack of vigilance almost resulted in 'Phillida' colliding with a semi-submerged tree trunk, but fortune was on my side as ‘Phillida’ narrowly missed the hazard. 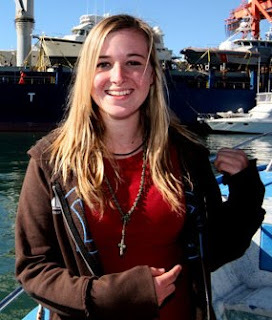 Could this have been the very object she struck on the outward passage? For some reason a repetitive rasping sound from the centreboard case caused me some concern, but as we trundled along, there didn’t appear to be anything amiss. I assumed the sound was caused by friction between the metal centreboard and its case due to the boat's motion. Shortly after dismissing my fear, a floating wooden crate came into view, the sort used for shipping bottles of wine, but sadly there was nothing in it except weed and crustaceans. There was no chance of making a quick profit through the generosity of Neptune. As the sun moved ever nearer to the horizon the wind almost petered out, which meant the combination of wave action and negligible pressure on the sail caused the centreboard to bang against its case. I solved the problem by jamming a short length of rope between the board and the case. About 2200 I hove-to and heated up a tasty paella, which I heartily consumed. It was to provide energy for my night vigil under a breathtaking, starry sky. While eating my meal I kept a wary eye on two ships, one eastbound and the other heading west. The evening forecast predicted an easterly Force 3, becoming northerly 4. 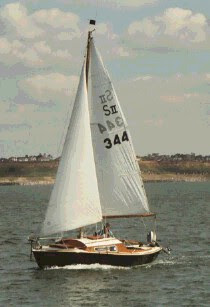 I didn't mind a northerly, because ‘Phillida’ performed well on the wind and on that point I could make her self-steer. Slowly but surely, the wind backed to the northeast, which was ideal for the boat to steer herself. Now and again I needed to adjust the sheets to maintain a neutral balance, but by doing so I could rest for half-an-hour or so between making adjustments. I heated a can of oxtail soup and decanted it into a Thermos flask; then I heard a ship, but saw no lights. Moments later I was surprised to see the long dark outline of a naval vessel possibly engaged in night manoeuvres. Before turning off the Primus I made myself a coffee to keep me awake. Vigilance was needed because we would shortly be entering a submarine exercise area. Caffeine boosted, and having cleaned my teeth, I felt pretty alert. An enormous orange moon slowly rose from the sea as if by magic. She wove a spell of interlaced golden light reflected from oily waves into my receptive mind. Her squiggly pathway over the sea to the cosmos was for the delight of an evening dreamer. So much for vigilance! Suddenly shaken from my trance by the early night chill I scanned the horizon for dangers. There were none; instead all I could find was my friendly dancing moon who quadrupled herself by sliding to and fro on bendy waves like magic mirrors at a fairground. There was a profound silence as if no other being existed - just me and the golden moon. Have you ever heard such a silence? Venus was shining brightly and a host of sparkling stars were coloured as the rainbow, except those embalmed in the Milky Way. Ahead lay the Pole Star and I recalled the lines of John Masefield’s 'Sea-Fever', "I must go down to the seas again, to the lonely sea and the sky, and all I ask is a tall ship and a star to steer her by." Enough of poetry! It was a dead calm. We weren't getting anywhere. 'Sherpa' was called into action. What a contrast there was - from perfect silence to ear shattering cacophony - but what a good speed we made over a glassy sea. Ahead there was a yacht on a reciprocal course showing her red and white navigation lights. I drew attention to our presence by shining my torch on ‘Phillida’s’ mainsail. All was well; we passed port to port. An hour after midnight the wind returned, but, from the north. It allowed me to turn the engine off and sail a course of 310 degrees towards Teignmouth. The wind backed a little, and as it did, I saw what appeared to be lights fairly high up. Were they an illusion, or were they real? Closer investigation confirmed they were the road lights of Teignmouth, and further to the north the little resort of Dawlish lay hidden shrouded in mist. A change of tack found us reaching along the coast at a fair old lick. I periodically sounded with the lead while trying to keep to the two fathom line. My aim was to clear the Pole Sands off Dawlish Warren. Soon after sunrise, all was revealed. The sands were deserted and I was privileged to witness a weird seascape of golden hues, which in some places contrasted with the dark turquoise water, reminiscent of Turner's masterpiece, 'The Fighting Temeraire'. The tide was flooding, and at 0600 we were beating up the fairway toward Exmouth Dock. When only a cable from the narrow entrance I downed the sails and quickly started the engine to avoid being swept over Shelly Bank. Within a short while, 'Phillida' was snugly berthed at the quay, while sausages, bacon, and eggs sizzled in the frying pan. I sponged up the surplus fat with two slices of fried bread and downed the lot. This was truly a feast consumed with much gusto - no other meal ever tasted so good! It was a beautiful sunny morning, and as I relaxed, my eye focussed on a few tiny crabs rummaging in bunches of bulbous weed which clung to the dockside, but it was time for action. Wasn't I supposed to visit Customs for pratique, since I had been to a 'foreign' land, and, shouldn't I look presentable at the end of my voyage? Having fortified the inner man, I gathered together my shaving gear, flannel and towel, for refreshing the outer man. A gent's toilet was sure to be nearby, and on the way I could look for the Customs Office and one of those beautiful red phone boxes so that I could let my wife know she was not a widow, and our daughters were not fatherless. I knocked on the Custom Office door. For a moment nothing happened; then the door slowly opened. A short, rather thin, heavily bearded man reluctantly invited me into his office. After prevaricating by maintaining I did not need proof of a clean bill of health he reluctantly produced a 'Certificate of "Pratique"'. It was my very first, which I treasure to this day. I was so tired I could have slept anywhere, almost under any conditions. As it was, the wind increased overnight, and by early morning there was a good Force 4 blowing straight into the harbour. Something must have warned me things were not quite right. I lifted the side of the tent and had a look around. 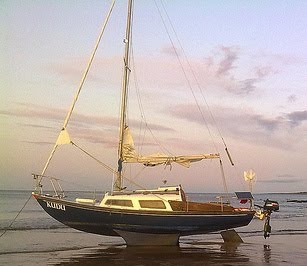 I was astonished to discover that ‘Phillida’s’ anchor had broken out, and that she was drifting towards a group of rocks. It was high water, and because the anchor warp had not been long enough to accommodate the rise of tide, the anchor had pulled clear from the seabed. I rapidly released most of the fastenings that keep the tent in place and pushed it forward along the boom to give me space for starting the engine. As we drifted closer to the rocks, the water became shallower, and the anchor dragged along the bottom. I hoped it would hold, but unknown to me it had collected a knot of weed. This had the effect of reducing boat speed until we came within an arm's length of a mooring buoy. I grabbed it, and made its line fast to the bow cleat. Braye Harbour is open to the northeast. Therefore I was glad to have the security of a good mooring. Although it was July, the wind was bitterly cold, which persuaded me kept the tent up to act as a windbreak. I tried conserving my body heat by wearing a couple of sweaters, a bobble hat and my waterproof anorak. Needless to say, being on the boat while she snatched against the mooring, rolled and pitched for twenty-four hours was a most uncomfortable experience. I expended quite a bit of energy trying to keep myself from being flung off my pneumatic mattress. The motion was diabolical. I listened to the radio to cut out the sound of the wind and waves and to cheer myself up, but the weather forecast confirmed I would have to endure the agony until the following morning. It was far too rough for me to get ashore by using my folding dinghy. After a fitful night I was relieved to find the wind had dropped, and that the sun was shining. I took the tent down and made breakfast. The smell of fried eggs and bacon caused me to salivate at the prospect of eating them, along with porridge, toast and marmalade. Shortly after clearing away the dishes and utensils I was visited by the owner of the mooring who gave me permission to use it for the duration of my stay. He told me where I could find freshwater, and he gave me directions to the post office and to Lloyds bank. I really looked forward to exploring the Island, and in preparation for being ashore for most of the day I made a packed lunch. It turned out to be a scorcher. Although I wore shorts and a tee shirt, the sweat poured off me as I slowly climbed the narrow road leading to the hamlet of St Annes. There I withdraw cash from the bank and noted where the phone box was. I spent the rest of the day tramping the island. I couldn’t fail to be moved by the fortresses that had been built during the war. They were built by slave labourers who had been shipped to the island by the German occupying forces. Many of these unfortunate prisoners suffered greatly while working on the fortifications, and a number of them died. At the end of the war German and British soldiers worked together to clear and prepare the island for re-habitation. Miles of barbed wire were taken down and thousands of mines were neutralised and recovered. I was able to walk freely around a significant portion of the island, and while doing so I was enthralled with the enchanting scenery, particularly views from the cliff walks. On returning to ‘Phillida’ late that afternoon, I cooked a meal. After I had eaten it, I rowed ashore to phone my wife - there were no mobile phones in 1971. When I heard her voice I became a bit emotional, because I had missed her so much. I hadn’t realised how important it was to share my thoughts and experiences with her. I was doubly shocked when she told me I was required to attend an interview the following Wednesday for a teaching post in Edinburgh. That meant I had to make the return passage soon - while the weather was good. Needless to say, I was excited at the possibility of a new career. My priority was a good night's sleep so that I would be refreshed and ready for the return trip to Exmouth. Time slipped by, and before I knew it, four hours of my life had been lost while I played the part of a somnambulant ship’s pilot who was suddenly woken from a trance by the glare of a powerful searchlight. A large tanker slowly emerged from the swirling fog, and as she lumbered by, a powerful beam of light shone from her bow until another from her stern reassuringly took its place. How I praised the crew's vigilance. Undoubtedly they had spotted us on their radar before cautiously proceeding. With hindsight, I supposed we were at the eastern end of the east-going shipping lane, which lay to the north of Alderney. The early morning light revealed an agitated sea. As the wind increased, I felt it prudent to double-reef the mainsail and set the small jib. Visibility was poor. At 0800 I took a DF bearing of the Alderney aero beacon which gave a position line of 230 degrees. I was tired and puzzled by the bearing. Had I been able to think clearly I would have changed course for Bray harbour to the southwest. In the event, I continued on a south-easterly heading. At 0912 things looked a little rosier, as a watery sun made its appearance, and I was inspired to shake out the reefs. Half-an-hour later the sun was so warm I removed my shirt and sunbathed, but the haze prevented any sighting of land. As very little was happening, I took the opportunity to bail out water that had found its way into the bilge. A jaunty French crabbing vessel briefly came into view, and as we passed each other, the Breton skipper politely doffed his cap to the mad dog of an Englishman. I continued on the same course, and when it was time for coffee at 1100, I was surprised by the appearance of a headland that emerged from the haze. At that moment I ceased keeping a written log, which only meant one thing - events became so demanding that I did not have a chance to record them. I was also very tired and anxious. 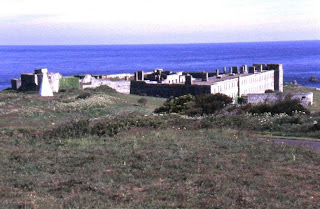 Was the unidentified headland the north-eastern end of Alderney? Most definitely not! It had a lighthouse, but it did not bear a resemblance to the description given in Reeds Nautical Almanac. Neither did compass bearings confirm that the promontory was that headland. 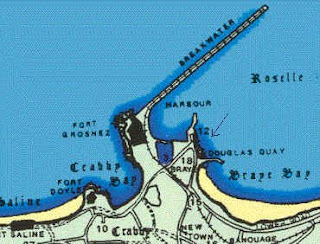 On the other hand the characteristics seemed to match those of Grosnez Point, on the north-western tip of Jersey - but that was impossible! There was no way my course keeping could have been that bad! I desperately needed sleep, and of necessity I sailed close to the headland to find a spot where I could anchor. I used my large fisherman anchor. It was attached to a short chain on the end of a very long length of tarred hemp, but to my consternation the current was so strong that the bow was dragged dangerously low in the water. Since I could not retrieve the anchor because of the force of the current, there was only one thing to do; that was to cut it loose! With a twang, the warp parted. Fortunately there was enough wind for the boat to sail between the rocks at the foot of the cliff. As I examined the lighthouse I noticed there were several excited people running along the cliff’s edge while waving their arms. They were apparently interested in my antics, and more than that, they were obviously concerned for my welfare. Perhaps they were amazed at the foolishness of the stupid Englishman? They must have guessed I was English, because ‘Phillida’ flew the red ensign at her stern. Half-an-hour elapsed while ‘Phillida’ stemmed the tide, then a large camouflaged motor vessel took up a station to leeward. Using my elementary schoolboy French, I managed to persuade those aboard that I did not need assistance and that all was well. 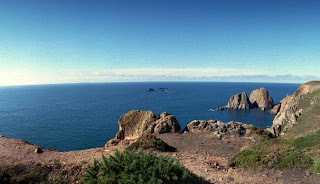 When scanning the horizon to the west for more clues as to where I was, I observed the unmistakable outline of Alderney. The island was silhouetted against the setting sun. Then, and only then, did it dawn on me that I was at Cap de la Hague! How stupefied I had been, not to have deduced where I was. Fatigue had incapacitated me, but my guardian angel must have cared, because there was enough wind for us to reach the safety of Braye and be anchored in the harbour by midnight. I was taken by the romance of the setting, as the craggy outline of cliffs and buildings came into view. The whole panorama was bathed in moonlight under a star-studded sky, animated by windblown silver clouds marching in formation to the west. I let go one of the two remaining anchors, and after rapidly arranging the boom tent, I fell into a deep slumber. I relaxed and lay back, as my body was pleasantly warmed by the sun. Now and then I would survey the horizon through 360 degrees, and as I did again, I noticed there was a small moth following from astern, struggling to catch us up. I was reluctant to reduce speed, but at the same time, I wanted this speck of life to gain a foothold. The tiny creature eventually made it, and clung precariously to a seam near the peak of the sail. How relieved I was that this living marvel had not succumbed to a watery grave. He spread out his wings and rested - despite the oscillations of the sail. Later in the afternoon, when checking to see if my companion was still there, I noticed the sky had become dappled with tiny grey clouds, resembling the scaly pattern found on a freshly caught mackerel. The moth had gone, but what was the significance of the dappled sky? With nothing better to do, I pondered the likelihood of the moth's survival, since the nearest land was at least twenty or thirty miles away. A margin of ten miles of uncertainty seemed quite a discrepancy, but I couldn't really be sure of ‘Phillida's’ exact position. Thirty-eight years later, things have changed enormously. I now possess a GPS which is hardly larger than my mobile phone, but it can give the yacht’s position within metres! Judging speed and distance was a bit hit or miss, because I did not have a trailing log. Apart from a primitive DF set, I was reliant upon a 'guess-estimate' of the distance travelled. 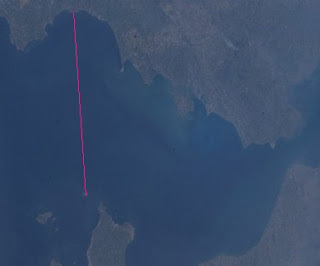 By using my deviation-free compass and making allowances for variation, leeway and tidal set, I could have some idea of the track and distance over the ground made good. By plotting the position of the yacht on the chart every two hours, I could have a rough idea of where I was. Speed was the factor most difficult to assess, because it varied from hour to hour according the wind strength. If I wanted to be more accurate, I needed to make a note of the time in seconds it took the boat to pass a floating object, then apply a simple equation: 'Speed equals the length of the boat, divided by the time taken.' Knowing the speed of the boat I could ascertain more accurately the distance travelled. As I was pondering these things, I noticed that ahead, there was something odd going on. I couldn’t make out what it was, but several gulls were taking an interest in a peculiar object. Could it be the rotting carcass of a seal or some other creature? A close inspection revealed a partially filled bathtub lodged among a mass of floating weed and splintered wood. Nearby there was a shiny red beer can which appeared to have been jettisoned just hours before, because there was not the least sign of growth on it. Later that afternoon we passed two anonymous looking vessels; both were going astern in unison. This was a mystery. As far as I could see, neither vessel had equipment deployed for minesweeping, trawling or laying cables. I was glad to be clear of them. An hour later, at 1730, a westbound freighter crossed ahead. She was about a quarter of a mile away. The presence of these ships led me to believe we were in the west going shipping lane. Therefore I plotted a rough position at 50 degrees 8 minutes north, and 2 degrees 50 minutes west. To the north, and stretching as far as the eye could see, there was a golden haze, and silhouetted within it there was a ghost ship silently gliding towards the west, where her ethereal presence vanished as mysteriously as it had appeared. 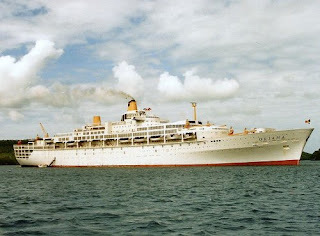 By her size and shape she could only have been the luxury cruise ship, the 'Oriana'. 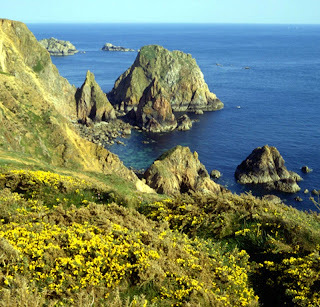 Six miles to the west of Alderney there is a very powerful lighthouse marking the dangerous Casquettes rocks. This is a treacherous area because of the currents which can run at speeds of five knots or more. 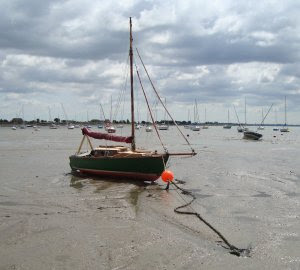 The range of the tide can be as much as nine metres! Before entering the area I needed to know my position more accurately, especially as there were shipping separation zones which had to be crossed. I hoped for good visibility so that I could identify light buoys. In theory I should have been able to see the loom of the Casquettes light when within ten miles of the lighthouse. Before nightfall I obtained a DF bearing so that I would have a rough idea of where to look. The DF gave a direction of 188 degrees true, but I was inexperienced at using the radio, and I couldn't wholeheartedly rely on the position line. While there was daylight I took the opportunity of studying the Alderney chart. It was an old-style Admiralty version that showed soundings in fathoms and feet. I made a mental note that the island was roughly three-and-a-half nautical miles long, and a mile-and-a-quarter wide. It lay on an axis bearing southwest to northeast. 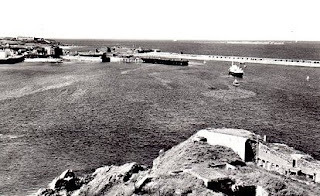 My intended destination, the harbour of Braye, was at the northern end. Lights were shown on the chart in magenta; land contours, prominent buildings, roads and footpaths were all clearly marked in black, so that I had a pretty good idea of what to expect. There were several off-lying rocks, which meant that navigating around Alderney in poor visibility would be no picnic. The wind filled in from astern, and it was quite a pleasant evening, which caused me to relax, but then I heard a thud as the bow struck something. ‘Phillida’ continued forward over the object as it scraped along her bottom. I anxiously examined the wake, but nothing could be seen. I assumed the object had been a bulk of timber, perhaps a large plank or a wooden crate. I carried out a thorough check of the hull, but I couldn't find any damage. At 2108 I changed course to 130 degrees to counteract the ebb, then I tried starting the Primus, but it refused to light; instead, I used my back-up methylated spirit stove to boil three eggs. By the time I finished eating them, it was nightfall, and I found comfort in the silver moon, while the boat was shrouded in a thin layer of sea fog. It wasn’t long before I heard the sound of a ship's horn, which sent a chill down my spine. At that moment I wasn’t as brave as I thought I was. Furthermore, adding to my anxiety, I could not see any sign of the Casquettes light, so I took a DF bearing which showed it was to the south where is should have been. This settled my mind somewhat. It was Sunday, the 4th July, 1971, just before eight in the morning. ‘Phillida’ was heading out to sea, and the Exe Bell Buoy lay a hundred yards astern. After setting the boat on her course I took a bearing of the buoy and noted the details in the logbook, along with the time. (The reason for the bearing was to check the boat’s course by taking back bearings.) The early morning forecast had predicted an easterly wind of Force 3 which was ideal for the planned crossing of the English Channel. Exmouth was gradually fading in the mist, and the clanking of the buoy’s bell became fainter and fainter. ‘Pillida’ was heading southeast for my planned destination, the tiny island of Alderney, the most northerly of the Channel Islands. 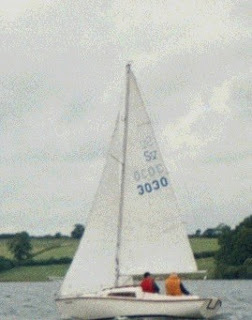 My boat was a Torbay Class 2 Racer. She had a large cockpit which I covered with a canvas apron. This could be rolled up from the rear to give room for working the boat. In addition to the apron, I made a simple boom tent to provide shelter from the elements for when at anchor, or when on a mooring or when beached for a quiet night’s sleep. She was a gentlemen's day boat typical of the era shortly before the Second World War. She carried a lot of sail on her slender mast which resulted in her having a good turn of speed, but at that moment because there was very little wind 'Phillida' was hardly moving. I reluctantly started the ancient Seagull outboard engine, which for a short time belched blue smoke until there was but the faintest wisp, then none at all. This trusty friend of mine whom I named, 'Sherpa', for his hard work, made an ear-shattering, but reassuring noise, comparable to rusted tin cans clanging together, but he never let me down. Half-an-hour later, the sun broke through the haze, heralding a light breeze which enabled the boat to move again under sail. To compensate for the set of the ebb I changed course a few degrees to the south. I could still see the entrance of the Exe estuary, where several rod fishing boats lay drifting on the flood tide. The red sandstone cliffs contrasted with the emerald green hills further to the east. Our course would keep us clear of the area reserved for the firing range. A straight line to Alderney was a distance of seventy nautical miles, but by the time of arrival the distance travelled through the water could well be getting on for eighty-five. It would take about twenty-eight hours at three knots, giving an e.t.a. near mid-day, Monday, 5th July. I needed to conserve my energy. Therefore I set about making the boat steer herself. By slightly backing the jib and easing the mainsheet, while the tiller was lashed a smidgen to leeward, a neutral balance was achieved. 'Phillida's’ wake was marked by a trail of bubbles which were off-set a few degrees from her centre line, confirming she was making very little leeway. I lay down on the floorboards and pulled the cockpit cover over my head to protect me from the sun’s scorching rays. It seemed all right not to keep a proper look out, because in that part of the Channel the likelihood of other vessels being in my path was minimal. Shortly before eleven, the wind petered out, and I could tell by the feel of the boat that she was off course and wallowing. I took advantage of the calm to make a coffee before steering by hand. My galley consisted of a gimballed Primus, bolted to the floor, and a washing-up bowl. Trimming the sails to every zephyr was hard work, but after twenty minutes the wind increased, and I set the boat to steer herself. The haze returned, causing me to be a little anxious. I felt alone, in an isolated world of my own. There was an eerie silence, except for the sloshing of water along ‘Phillida’s’ hull. To comfort and fortify myself I opened the food box for a helping of cold chicken, lettuce, beetroot and cucumber, which I ate with chunks of buttered cottage loaf. This was swilled down with a generous helping of bottled lemonade. Then I heard the unmistakeable deep-throated sound of a ship's horn. The ominous warning notes were coming from somewhere broad on the port bow, but how far away the vessel was I could not tell. Every two minutes she made her doleful drone. Twenty minutes later the vessel was clear ahead, which meant she was slowly moving to the south-west. I figured this would be in keeping with a ship on course to clear Lizard Point, from where she would take her departure, perhaps for an Atlantic crossing, or maybe to the south, when west of Ouessant. The haze grew thicker, and I suppose I should have expected it, since we were more or less slap in the middle of an area of high pressure. Cold air was falling from above onto warm water below, bringing about a surface layer of condensation. The sky was a perfect unblemished azure blue, but all around there was a thick yellow veil. The wind faltered yet again, so I set 'Sherpa' to work after refilling his tank, and within minutes we were doing a good four knots. An hour-and-a-half later the tank needed replenishing, but the wind returned and visibility improved. How uplifting it was to be sailing, while rejoicing at the chuckling waves spreading ever outwards from ‘Phillida’s’ bow until lost in the vastness beyond the distant haze. 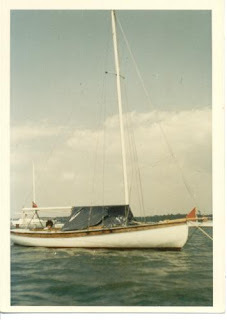 Here are three photos of my very first seagoing sailing boat. She had a short bowsprit and a tall mast to support a large Bermudan mainsail. Her galvanised centreplate passed through a slot in a shallow, iron keel. 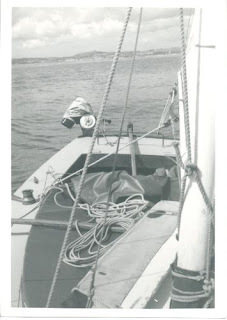 The monochrome photo shows the folded Prout dinghy lightly lashed to a whisker pole above the cockpit cover. The tiller is held in place by an elastic cord as the boat sails a steady course. You’ll note that in those light conditions, there is slight lee helm. There’s hardly any wake, but what there is, is dead straight. The Seagull outboard is mounted well away from the rudder to keep the propeller from interfering with the rudder. The combination of her firm bilge, stub keel and iron centreplate made her a stable vessel, well able to hold full sail up to Force 3 before her crew needed to roll a reef around her boom. Despite being only 19’ from bow to stern she would out-perform many larger yachts. She was a racing craft probably built shortly before the Second Wold War to be sailed by ‘gentlemen’ of Torquay on the sparkling waters of Torbay. 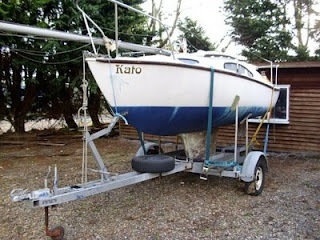 I saw her potential as a coastal cruiser and I used her for that and for day sailing on the River Exe. 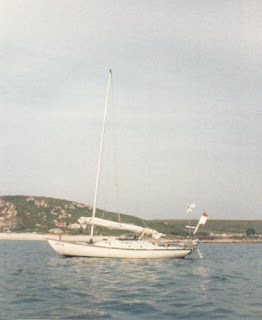 My longest cruise with ‘Phillida’ was to Alderney and back. Please don’t think I spend all my time looking at YouTube videos. The ones I like I save, and I place them into Playlists. If you fancy exploring any, copy the link and paste it into your Browser’s address box; then hit the enter key or click the ‘refresh’ button. The number of videos in each Playlist is shown in brackets. I’ve tried not to duplicate them, but a few may have slipped through the net. As time passes by, videos may be added to the lists, and some may disappear. All six lists contain clips featuring small sailing boats. 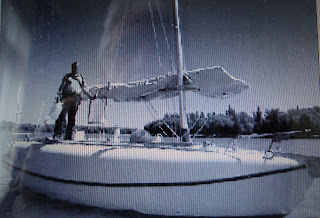 I am indebted to Al Law for letting me use his videos in the first group, ‘‘Faith’ a Paradox Sailboat’ – apart from the last clip which was filmed by my daughter. It shows my first attempt at using a yuloh, which was pretty abysmal. Never mind, I got over it and equipped ‘Faith’ with an outboard motor! Well, that makes sense to me, so perhaps I’m not quite so ignorant now. Anyway, I accidentally found Nathan’s YouTube videos, ‘Sailing around Britain on ‘Kudu’’. There are seventeen of them in all, illustrating his voyage from Tower Bridge, London to Preston Marina. There he abandoned his attempt to try something different. Kudu is currently up for sale, so if you want to complete the voyage around Britain, now is your chance! Nathan has acquired a 22’ Tyler Cinder with an inboard engine which he says will suit him better for his intentions, and she has standing headroom – no more crouching for the Dynamic Designer of PHP. Meanwhile, Nathan has gone back to work, presumably to pay for the forthcoming new thing. I note that his name is still on the official entry list for the Jester Challenge 2010, which is the trans-Atlantic race for solo sailors, named after ‘Blondie’ Hasler’s famous, junk-rigged Folkboat, ‘Jester’. Incidentally, at the recent London Boat show, Sir Robin Knox-Johnston presented Nathan with the Little Ship Club’s ‘Suhaili Trophy’, presumably for his exploits with Kudu and for his Practical Boat Owner magazine contributions, his Blog and his YouTube videos. 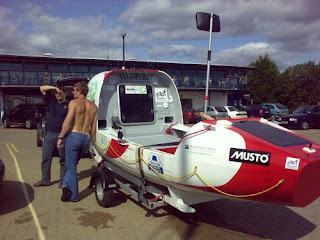 On Sunday, 6th September, 2009 I posted a Blog about Charlie Pitcher,* the trans-Atlantic rower who is doing very well in the current race organised by the Woodvale Challenge Events. Twenty two days ago he crossed the start line at La Gomera, the Canary Islands, with seven other solo rowers, twenty doubles and one boat with a dozen rowers. They are all pushing on to achieve their objective of reaching the finish line at Antigua, in the West Indies. 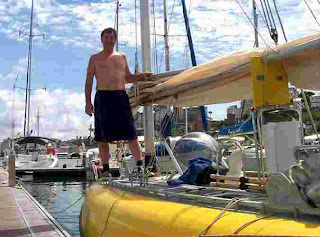 Charlie is a local East Coast sailor who has strong connections with Burnham-on-Crouch. He already has a track record at competitive events such as running in the 150 mile desert Marathon des Sables, and being involved in the America’s Cup, the Admiral’s Cup and the Whitbread and Olympic yachting campaigns. One of the reasons for Charlie taking part in this personal challenge is to raise money for Addenbookes Children’s Hospital. In September of last year I happened to bump into Charlie when he was retrieving his unique rowing boat, ‘JJ’, from the water at Burnham Marina after a training stint that took place at night in the North Sea. 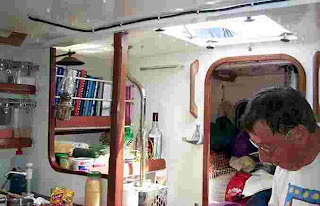 His boat complies with the rules of the Race, but she has a unique, large bulbous bow where he sleeps and takes refuge during gales, whereas the other boats have their ‘living’ accommodation at the stern. Another striking feature is a drop plate near the bow which balances a deep rudder hung forward of the transom. The high cabin will give Charlie a marginal advantage when running downwind by keeping the bow pointed in the right direction, i.e., to the south-west and west, as the prevailing winds for the majority of the route are from the north-east and east. If he encounters winds from the north or south side he will use the drop plate to minimise sideways drift. There may be occasions when he will be able to trim the boat by adjusting the rudder and the drop plate to create forward motion, even when he is not rowing. By doing this Charlie will not be breaking any rules of the Race, and there may be times when the bulbous bow will be a disadvantage, such as when he is rowing obliquely across the wind. Possibly, the drop plate could help counteract drift in that situation. Unless anything goes wrong, Charlie has a very good chance of being the winner. As I type, he is in front of the fleet with a 50 mile lead on his nearest competitor. He is very fit and in fighting form. He may even break the existing record time for a solo rower. Yesterday I explored options for the type of tender best suited to my use aboard my Seawych 19 sloop. Large inflatable dinghies were ruled out for practical reasons, which left a choice between lightweight folding boats and inflatable canoes. The argument went in favour of the Bic YakkAir HP One kayak, but she was pretty expensive at around £689.00. 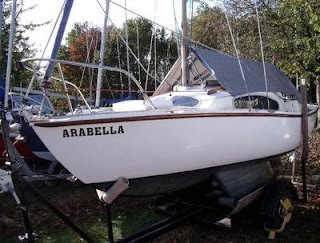 As a long-term investment she may prove good value for money, because she’s a proper little boat in her own right that could provide a lot of fun. I could use her when camping or when I may want an impromptu trip on the river or have an outing to the beach. 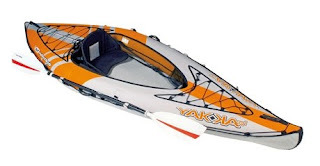 I must say I’m attracted to the YakkAir HP One kayak, particularly because of the effectiveness of her patent high pressure floor system which improves rigidity and shapes her underwater section for effective tracking. All things have to be considered. 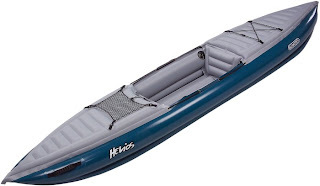 If I’m looking for a temporary solution, a cheaper canoe would do the trick; after all, I may only use her three or four times during the summer cruise. On that basis I could consider the following single-seat canoes: Sevylor DS Kayak at £345.00; Sevylor Rio Canoe at £250.00; Gumotex Helios at £230.00; or the very cheap Challenger K1 at £55.00. 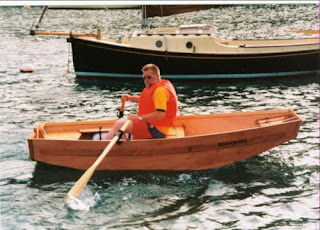 Jeff Michals-Brown left a comment on yesterday’s Blog suggesting I may consider a Sevylor Tahiti double canoe. He has been satisfied with his, which he has used as tender for his 20’ yacht. Certainly, the price is attractive at £130.00, including paddles, pump, and seats. There is also the bonus that there is room for another person, or for gear. I could also consider the Sea Eagle 330 at £250.00. Fortunately, there’s no need for me to rush into making a decision. I may even build a small folding tender, such as an Origami. Indeed, I could manage without a tender. Therefore I need to mull over the possibilities, and meanwhile I should look at a few inflatable canoes, even try them before coming to a conclusion. I’ve been considering what boat I may buy or build to ferry me between the shore and my Seawych 19 sloop. This coming season when I’m away cruising, there may times when I shall need to go ashore for some essential item, or perhaps just to take a walk. A small dinghy that can be stowed in the forepeak would suffice. 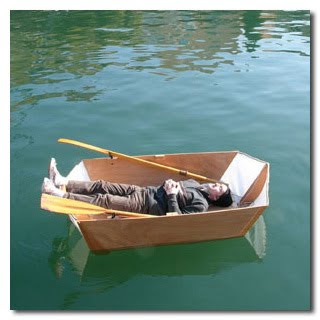 When I had my very first cruising boat, I found that a small Prout folding dinghy was adequate. She was about 7’ long and 4’ wide, and when folded, she was a wafer-thin 7’ by 1’ 6” by 6” package. 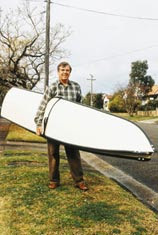 This lightweight canvas cockleshell could be ready for the water in less than two minutes, but she had her limitations, such as no internal buoyancy, not much freeboard and she was strictly a one person boat. Today, there are only a few similar dinghies on the market, such as the ‘Crafty Scamp’, the smallest of the SeaHopper range, but she’s far too heavy and difficult to assemble on a yacht with restricted space. Furthermore, when she’s packed away she’s a lot more bulky than my old Prout – pricey too at £698! What about the Wooden Widget Origami? Well, she is a better proposition, being similar to the Prout. Unfortunately, she cannot be bought off-the-shelf. She has to be built from plans costing £25.00. Then, there’s the smallest Porta-Bote which is too long to fit into the Seawyich’s cabin or to stow on her deck. 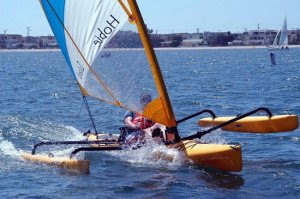 An alternative to a folding boat is a pneumatic dinghy, which is the first choice of most yachtsmen. 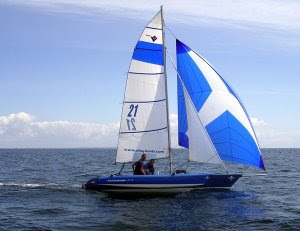 One of the cheaper ones is the Waveline 2.3 at £319.95 – that’s less than half the price of a small SeaHopper! 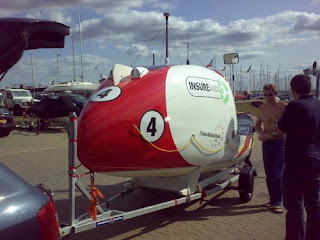 The problem with the Waveline or any other inflatable dinghy is finding a place to blow her up. 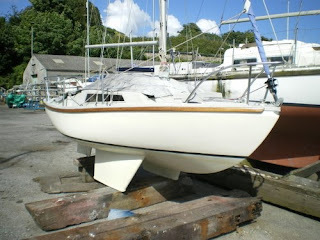 One possibility is to haul her up the mast until her transom is on the foredeck. There she can be inflated before being lowered over the guardrails into the water. Retrieving her would be a reversal of the process, but it all seems a bit of hassle. I’m favouring the idea of a one man inflatable canoe. Because she’s not as beamy as a dinghy, she could be inflated on the cabin top. Launching her would be easy. Getting aboard her may not be as easy, but if a single line or painter is attached midway between her bow and stern, that should hold her to the side of the yacht. 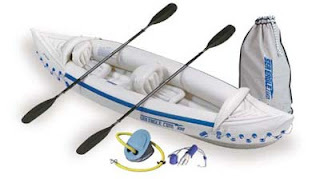 A nice-looking inflatable canoe for a solo paddler is the Bic YakkAir One, but she doesn’t come cheap, at around £689.00. There are much less expensive inflatable kayaks. However, they lack the high specification and the durability of the YakkAir One, which has a patent system, giving rigidity and good tracking. If you’re looking for an exceptional visual record of the coastline, estuaries, creeks, harbours and ports of Britain, you need look no further; just take a peek here* and you’ll be hooked. Dylan Winter is one of those people who know where to find a story. He’ll take you to places you never thought existed, from factory polluted waters to salt marshes where wintering geese graze, from scenes of waterside blossoms, riverside pubs, boatyards and docks; to dark winter days when icicles frame the porthole and snow covers the deck. You’ll see barges, ships, all manner of craft, and hear of times past. You’ll meet interesting folk with yarns to tell, but most of all, if you open your ear to his soothing voice, you’ll hear great wisdom and learn of contentment from the Man of the Sea. Dylan is a gifted commentator, and he is no amateur filmmaker; his presentations are second to none, and wow, what a clever interviewer he is too! You’ll be the loser if you don’t take this free treat. 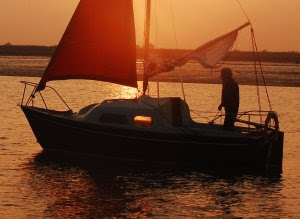 My Folksong ‘Zeta’ was built over a period of three years from a GRP hull and deck supplied by the designer and boat builder Eric Bergqvist. Details of her may be found by visiting this page of my Blog: http://bills-log.blogspot.com/2009/12/zeta-folksong.html . You can see a photo of her above, when she was anchored at the Scilly Isles. I had intended to make a circumnavigation in her, but you can read the full story by visiting the aforementioned web page. However, I sold ‘Zeta’ to Richard who was to become a very good friend. 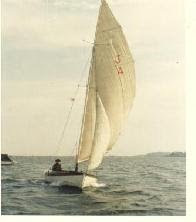 In fact, I sailed many more sea miles aboard ‘Zeta’ when Richard owned her than when she was mine. He sailed her around England, remarkably, by doing it at weekends and during his holidays! I crewed for a couple of the legs: Milford Haven to Wexford, and Wexford to Dublin. Apart from Richard’s circumnavigation of England, I crewed for him on trips along parts of the South Coast as far as the Scilly Isles. I digress, because this is not about ‘me’, it’s about Julian Mustoe, and the transformation of ‘Zeta’. 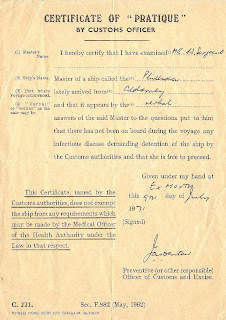 Julian acquired ‘Zeta’ from Richard with the intention of using her to follow in the wake of HMS Beagle. This historic vessel took five years to complete a circumnavigation, during which time the naturalist Charles Darwin made meticulous notes and collected specimens that helped him to come up with a the theory of the origin of the species. He subsequently wrote a thesis, ‘On the Origin of the Species’, which was published in 1859. Robert FitzRoy was the Beagle’s captain. Julian’s aim was to compare his findings with those of Darwin and FitzRoy. Before he set off on his great adventure, Julian showed me around ‘Harrier’, for he had given ‘Zeta’ a new name related to the ‘Beagle’. As you may know, beagles are the hounds that accompany a hunt, otherwise known as harriers. I was in for a big surprise! Julian had completely stripped ‘Zeta’s’ interior and removed the superstructure of ‘my’ lovely yacht, before rebuilding ‘his’ yacht. He only had wanted ‘Zeta’ for her hull and her encapsulated lead ballast. His yacht resembled a humpback whale, but the increased volume gave her standing headroom and more storage space. The transformation was all carried out to a professional standard, and from the functional viewpoint it appeared good, but I had my doubts about the yacht’s windward ability. ‘Zeta’ had never made rapid progress when fine on the wind in anything above a Force 3, but now, with the increased windage and added weight I feared her speed would be reduced. Julian’s intention was to take ‘Harrier’ through the Beagle Channel and along the hazardous south-western Chilean coast, and although the ‘Beagle’ had made it, I fears for him. As things transpired, there were to be surprises, the biggest being the shipwreck of ‘Harrier on the Peninsula Valdes, Argentina, and before that, her dismasting in a separate incident. The full story of, ‘The Death of ‘Harrier’’, can be read at Julian’s web site: http://harrier.users.netlink.co.uk/2004/Death_of_Harrier.htm . Julian, by the grace of God, survived and went on to buy another yacht, which he named ‘Harrier’ before continuing his voyage. The last time I heard from him, he was in New Zealand, with half of his circumnavigation to complete. He is a survivor, and I feel convinced he will succeed, where I failed, even at the start! The Silhouette Mk 1 was a Robert Tucker design with some of the characteristics of the larger Caprice, although I believe lines for the Silhouette were drawn before those of the Caprice. She had long bilge keels, and a big skeg to which the rudder was attached. 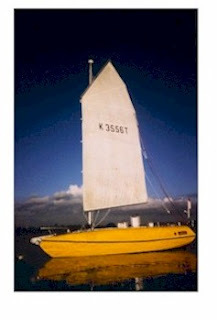 Made of marine plywood, this 17’ 3” by 6’ 9” single chine, two berth sailing cruiser, was uniquely distinguished by her double-curved sheer line. To my eyes, the bendy line was an aesthetically attractive feature that enhanced her appearance. The increased height of her topsides, forward of amidships, was a practical solution to providing more interior space than would otherwise have been possible for such a small boat. The Mk 1 had a solid, 20 foot wooden mast mounted in a substantial, galvanized tabernacle. Modestly rigged with a 45 square-foot jib and a 65 square foot mainsail, her forestay came short of the mast top by a few inches, and her side cap shrouds were attached to chainplates mounted abaft those for the lower side shrouds. 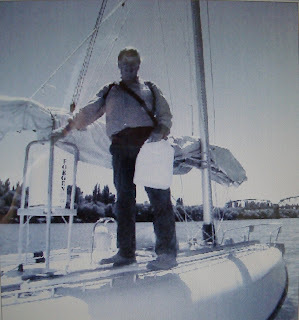 She had fixed, swept-back spreaders clipped to the cap shrouds, and a standing backstay. In the late 1950s when the Mk 1 Silhouettes were being built, most of them would have relied on Seagull outboards for their auxiliary power. A few Mk 1 boats were fitted with Stuart Turner inboard engines located under the bridge deck. 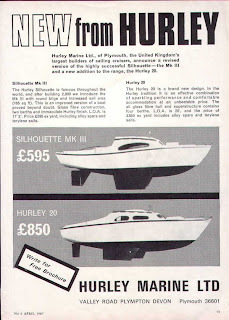 These early boats were mostly built from plans by amateurs, but in 1960 Hurleys of Plymouth supplied kits for the Mk 2 version. Incredibly, by the end of 1961 there were over 1,000 UK Silhouettes and others in various parts of the world.